Newtonmore’s Ewan Fraser gets out of the way as Kingussie’s Alexander Michie and Newtonmore’s Evan Menzies start swinging. Newtonmore v Kingussie in the Marine Harvest Premiership, played at The Eilan, Newtonmore. Saturday March 23 saw three local derbies in the Mowi Premiership and the continuation of Fort William’s good start to their Mowi National Division campaign. Oban Camanachd manager Stephen Sloss had Chrissie MacMillan free of suspension but a knee problem meant he started on the bench alongside Keith MacMillan and Ross Campbell. Scott MacKillop remained out with a foot injury and Daniel Madej was not risked as he had a hamstring niggle. Kinlochshiel manager Johnston Gill was content to allow Keith MacRae to continue his return from a serious knee injury with the club’s second string. Defender David Falconer had a shoulder problem so he also missed out. 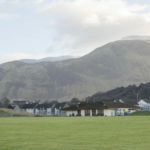 Kinlochshiel started towards the golf course end of Mossfield with the wind at their backs but the first chance of the match fell to Oban Camanachd after two minutes. Scott MacMillan played the ball to Daniel MacCuish who gave Andrew MacCuish the chance to shoot, but he was denied by a good save by Stuart MacRae who turned the ball away low to his right. Lorne Dickie, Aidan MacIntyre and Scott MacMillan in the Oban Camanachd midfield struggled to get into top gear and, midway through the half, Oban Camanachd changed formation in attack from the traditional two-two to a three-one formation with Andrew MacCuish alone up top on the ‘D’. The hosts had a great chance to take the lead on 28 minutes when Daniel MacVicar was hacked down inside the ‘D’. Referee Ross Brown awarded a penalty but Andrew MacCuish, who rarely misses from the spot, saw his effort go agonisingly wide of the keeper’s left post. Oban Camanachd got the goal they craved a couple of minutes before the break. Aidan MacIntyre sent the host’s first corner of the match into the danger area but neither Daniel MacVicar nor Andrew MacCuish could get on the end of it and the ball was turned away for another corner. This time McIntyre drifted the ball to the near post where a defender turned it away. Scott MacMillan ran in on the far side and shied the ball down into the net to give his side the lead. Oban Camanachd manager Stephen Sloss asked more of his players at the break and the home side now had the wind in their favour. Chances were few and far between, however, with most of the game now played out in the midfield. Aidan MacIntyre sent a ball into the goal area on 63 minutes and, when Kinlochshiel failed to clear, Daniel MacVicar whipped a shot over the top so it remained 1-0. 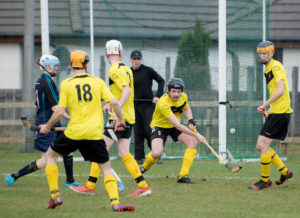 Oban Camanachd made changes with youngster Ross Campbell coming on in attack where he went on to do well against Scottish international Connor Cormack. Malcolm Clark, who did well as a make-shift half back, was replaced by Keith MacMillan. With the match finely balanced, Kinlochshiel drew level on 71 minutes. Jordan Fraser, who was well policed by Garry Lord, got away from his marker and his shot from the angle on the left beat keeper Cameron Sutherland at his near post. Oban Camanachd went back on the attack and a Daniel MacCuish shot fizzed wide on 78 minutes. It was Kinlochshiel who produced a storming finish. Cameron Sutherland did well to use his hand to keep out Duncan Matheson’s strike on 87 minutes. Jordan Fraser crashed a shot over before Finlay MacRae’s effort was parried with his legs by keeper Sutherland with a minute of regulation time remaining. 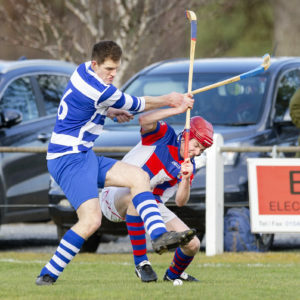 Oban Camanachd’s Daniel Cameron picked up a yellow card for persistent fouling which means he will miss his side’s next match at Kingussie in early April. 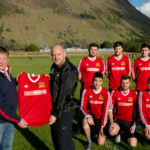 Oban Camanachd assistant manager Kenny Wotherspoon said: ‘We are aiming high this season so we’re disappointed with another draw. ‘I think it will be a season where all teams in the league will drop points and no-one is going to win all their games. ‘We don’t have a match this Saturday which is frustrating as the season has been stop-start so far. Kilmallie and Lochaber were scheduled to meet at Canal Parks but wet weather meant the fixture was reversed to Spean Bridge on Friday. Martin Stewart also returned and played at wing back. Key defenders Steven Stewart and Stephen McAlister were unavailable so Craig MacIsaac was pulled in at half back with Robbie McFadyen going to full back. Both were outstanding. Lochaber have Calum MacDonald back in goals after missing most of last season through injury but they were without Martin Johnstone. This was a very close match and Calum MacDonald made good saves in the first half. Lochaber came right back into it though with a Ben Delaney goal a couple of minutes later. Calum MacDougall had a reasonably quiet afternoon by his standards. However, he proved to be the match-winner, finishing high into the top corner of the net on his back hand, with just 14 minutes to go. Kilmallie manager John Stewart said: ‘It was a very tough match. Lochaber keeper Calum MacDonald had some very good saves in the first half and you start to think it’s not going to be your day. Liam [MacDonald] gave us the lead but, to be fair to Lochaber, they came right back at us and they levelled through Ben [Delaney] soon after. Kingussie were 3-1 winners against Newtonmore in the first Badenoch derby of the season at the Eilan. 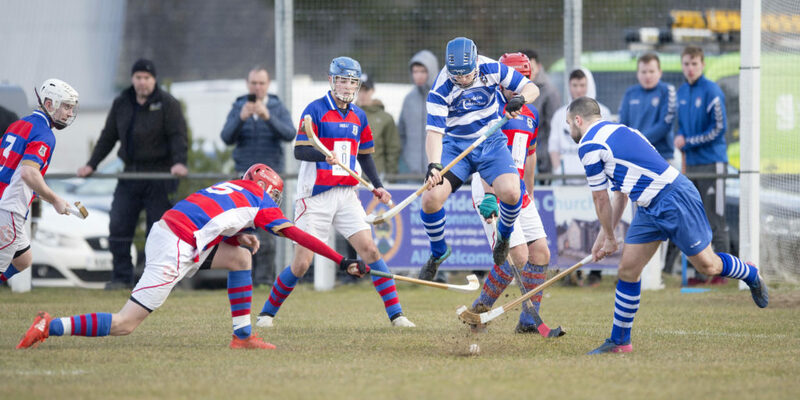 Newtonmore skipper Evan Menzies recovered sufficiently from injury to play at full forward but Glen MacKintosh was unavailable as he was on holiday. Steven Macdonald was free of a three-match suspension and started in defence. Kingussie won the corresponding fixture last season and took the lead after 19 minutes. Savio Genini ran infield to just outside the penalty spot where he got onto a Fraser Munro hit-in from the right. The ball took a bounce and Genini, who was afforded too much space, took a touch before firing the ball low into the net, beating keeper Kenny Ross on his right. Newtonmore drew level on 25 minutes. Michael Russell played in a corner from the left which was cleared by Robert Mabon. Steven Macdonald played a great diagonal ball which went over Fraser Munro and Rory MacKeachan to Russell who remained on the left and took a touch before lifting the ball over the keeper and into the net to make it 1-1. Kingussie lost Craig Dawson on 35 minutes after the keeper pulled his calf muscle when making a good save from Fraser MacKintosh, so Rory MacGregor took over in goal. Kingussie went back in front on 64 minutes. Ruaraidh Anderson won possession in midfield following a Newtonmore goal hit. He found Savio Genini who quickly switched play to Roddy Young who shoulder-barged Rory Kennedy to the ground before lifting his head and steering a low driven shot between defender Steven Macdonald and keeper Kenny Ross and into the net. Newtonmore pushed Steven Macdonald forward but did not get enough balls up to him to give them a chance of drawing level. James Falconer sealed Kingussie’s 3-1 win on 72 minutes. Another Fraser Munro hit-in from the right was gathered by Roddy Young who held off Rory Kennedy and crossed low from the right. Andy MacKintosh tried to get the ball away but it went straight to James Falconer who ran in and thumped the ball home on his back-hand. Newtonmore’s Fraser MacKintosh and Kingussie’s Calum Grant during last Saturday’s Badenoch derby. Photograph: Neil Paterson. Caberfeidh defender Blair Morrison, who dislocated his shoulder playing football, was declared fit to start in attack. Greg Matheson grabbed a hat-trick, including a penalty, with Martin Mainland, Fraser Heath, Lorne MacKay, Marc MacLachlan and Chris Johnson also scoring. Kevin Bartlett scored twice for Caberfeidh, one a penalty. 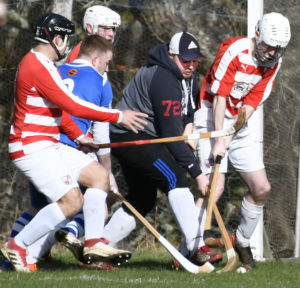 Kyles Athletic and Inveraray finally got their seasons under way but their match originally scheduled for Tighnabruaich was switched to Strachurmore because of an unplayable field. John Whyte returned in goals for Kyles, so Innes MacDonald played outfield. There was also a place in the squad for former Newtonmore player Paul MacArthur. Kyles got off to a great start with Scott MacDonald scoring after two minutes. Lewis MacNicol made it 1-1 on 19 minutes and that’s the way it stayed until the break. Three goals in the final eight minutes gave Mowi National Division leaders Fort William a 3-2 win over title rivals Skye Camanachd at An Aird. Skye started with the wind and looked dangerous up front so it was no surprise when they took the lead on 10 minutes through Will Cowie. Fort William came back into it and after a lot of pressure; the inevitable goal came through Alexander MacMillan on 82 minutes. Fort William were lifted by the goal, however, when Skye substitute Iain MacLellan found Will Cowie with a nicely weighted pass, Cowie struck a brilliant shot from distance which gave the keeper no chance and Skye led 2-1 with five minutes remaining. Skye might have thought they had done enough to win the game but Fort William had other ideas. Fort William won the ball in the middle of the park and when they played it forward, Lachie Shaw levelled with a nice finish inside the ‘D’ and it was now 2-2 with three minutes remaining. At that point, a draw seemed a fair result but, with a minute remaining, Skye keeper Ryan Morrison pulled off a really good save but the rebound fell to Padraig McNeil tapped in to win the game. The victory means Fort William stay top of the league with three wins from three matches. The sides meet again this Saturday in the first round of the cottage.com MacTavish Cup, this time in Portree. Fort William’s Sean Cameron clears his lines during the game against Skye. Glenurquhart were too strong for Oban Celtic, winning 9-0 in their 3pm throw-up at Blairbeg. Glenurquhart, who played premiership shinty last season, are looking good for a quick return under new co-managers Stuart MacKintosh and Eddie Tembo. The visitors included three 16-year-olds and 14-year-old John Douglas who again played well at half forward and on the wing. Oban Celtic tried hard throughout the game but the Glenurquhart forward line played some sharp, cutting shinty and Neale Reid on three minutes and James MacPherson on 14 minutes gave them the early lead. Ewan Brady chipped in with a brace on 69 and 75 minutes meaning all four Glenurquhart forwards had found the net. James MacPherson completed his hat-trick a couple of minutes from time to round off the 9-0 win. Glenurquhart have scored 12 goals without reply in their opening two league matches. Elsewhere, Bute and Glasgow Mid Argyll drew 0-0 at the Meadows, whilst the match between Strathglass and Beauly was postponed following the sudden death of Strathglass player Lawrence Jones. Glengarry made a strong start and took the lead after seven minutes following a free-hit just outside the ‘D’ after one of the visiting forwards had been fouled. The ball was played into the ‘D’ and Nick Dalgety popped up amidst the swinging camans to poke the ball over the line. Both keepers – Ronan MacMillan for Lovat and Glengarry’s Gordon MacDonald – made good saves and Glengarry took their 1-0 lead into the break. Glengarry went 2-0 ahead four minutes into the second half when Steven Cameron and Nick Dalgety combined and Dalgety whipped a 20 yard shot into the bottom corner of the net. League leaders Lovat had been relatively quiet in the match but started stringing passes together with Ryan Ferguson taking a grip of the midfield. When referee John Angus Gillies awarded the hosts a free-hit outside the ‘D’ on 57 minutes, Raymond Rennie hovered around the ball before flicking it over the Glengarry defence, finding Cammy MacMillan, who drilled the ball past the keeper at his left post. Glengarry created a couple of chances to restore their two-goal advantage and Nick Dalgety was denied a hat-trick by Lovat keeper Ronan MacMillan. Lovat rescued a point with seven minutes remaining when Finlay Ogilvie scored his third goal in two games. A long Ryan Ferguson free-hit from the middle of the park found Raymond Rennie 15 yards from goal. Rennie turned his marker but his low, hard shot was saved by Gordon MacDonald. However, the ball rebounded out to the on-rushing Finlay Ogilvie who slotted the ball past the keeper and his third goal in two games made it 2-2. Lovat’s Ryan Ferguson played well in midfield against Steven Cameron, whilst Bailey MacKay had a strong second half battle with Nick Dalgety. Skipper Rhuairaidh MacDonald and Nick Dalgety were the pick of the Glengarry players, along with veteran Steven Cameron. Elsewhere, the Caberfeidh seconds beat the Kingussie seconds 2-0 and Inverness were 6-0 winners against the Kinlochshiel seconds. The meeting between the Skye Camanachd and Fort William second teams was called off on Saturday morning. This was a tough game played on difficult surface which didn’t suit the Oban side. Scott Buchanan played in goals for Lochside which allowed boss Brian MacCallum to join 13-year-old Innes Jackson on the bench. Early injuries to Lewis Buchanan and Jordan Kerr meant both had to come on sooner than expected. Lochside had chances in the opening period but they fell further behind a couple of minutes before the break when Iain Wilson scored from the edge off the box, sending the ball through a ruck of bodies and into the bottom corner of Scott Buchanan’s goal. Afterwards Brian MacCallum said: ‘With young Ross Campbell with the first team and a number of players unavailable, this was always going to be hard for us but there was a fantastic effort from the squad. Aberdour came from a goal down to beat Taynuilt 3-1 at Taynuilt Sports Field. It was no surprise when Taynuilt took the lead on 14 minutes through David Campbell. The hosts could have been further ahead at the break, had it not been for a terrific penalty save from visiting keeper Craig Callaghan. Aberdour grabbed a crucial third goal on 76 minutes when Ruaraidh Reid held the ball up well before scoring. Tayforth and Ballachulish shared the points following a 3-3 draw at Peffermill. The Inveraray second team were unable to raise a team for their match against the Glasgow Mid Argyll seconds at Yoker. Inveraray were deducted two points and the fixture will be re-scheduled. Duncan MacPherson equalised on the hour and Neil Hope on 75 minutes and Ross Anderson five minutes from time gave Boleskine their first win of the season. Elsewhere, a dominant first half performance helped Lewis Camanachd to a 7-1 victory over the Inverness seconds in their 1pm throw- up at the Bught Park outside pitch. The match between the Beauly and Strathglass second teams at Braeview Park will be re-scheduled. Lochcarron’s clash with Strathspey Camanachd was postponed. Freddie Patterson on 28 minutes and Simon Patterson on 32 minutes had Ardnamurchan 2-0 ahead. Elsewhere, the Aberdour reserves scored three times in the last 13 minutes to beat the Bute reserves 3-0 at Silversands, whilst the game between Kilmory and Glenorchy at MacRae Park was postponed. Skye Camanachd Ladies recorded their first win of the season, defeating newly-promoted Glenurquhart 13-0 in their Mowi National Division match at Blairbeg. Lorna MacRae and Sarah Corrigall grabbed four goals each, whilst Jenna Beaton and Abby MacLean bagged doubles. Ilana Paterson got the other. Glasgow Mid Argyll beat Ardnamurchan 7-0 at Yoker. The draw for 2019 Sutherland Cup competition was made at the Camanachd Association Office, Inverness, on Wed-nesday March 20. The Sutherland Cup Final takes place on Saturday July 20, with the venue still to be announced.